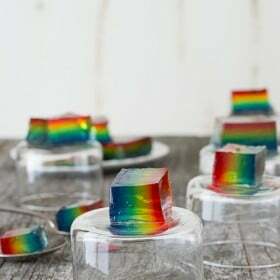 Rainbow Jello – create easy rainbow jello squares using 6 different colors of jello. April showers bring.. rainbows! Spring is the perfect time for rainbow colored treats. Warmer weather is in the air, I hear the birds chirping again… and there is snow on the ground! Grrrr. I think I prematurely packed away all of our winter gear, but I am refusing to pull anything down from storage so my fingers will just have to put up with it. Can I let you in on a secret? I didn’t like rainbows or things in rainbow order until recently. And by recently I mean, until I made those ridiculous rainbow donuts. Now I want to make everything rainbow colored! I even ordered a rainbow cookie cutter and I’ve been having dreams about rainbow dipped twinkies. Weird. Well, my ways have changed and I’m on board with rainbows. And fluffy kitties and unicorn poop cookies. Eww, just kidding. 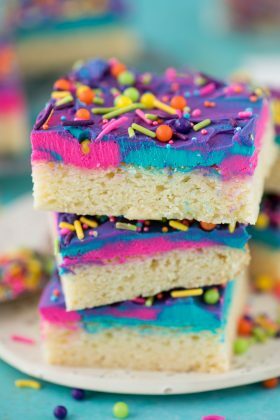 But unicorn poop cookies (see here on pinterest) are a real thing, and being rainbow colored, I now like them, except someone had to go and ruin them by calling them unicorn poop cookies. 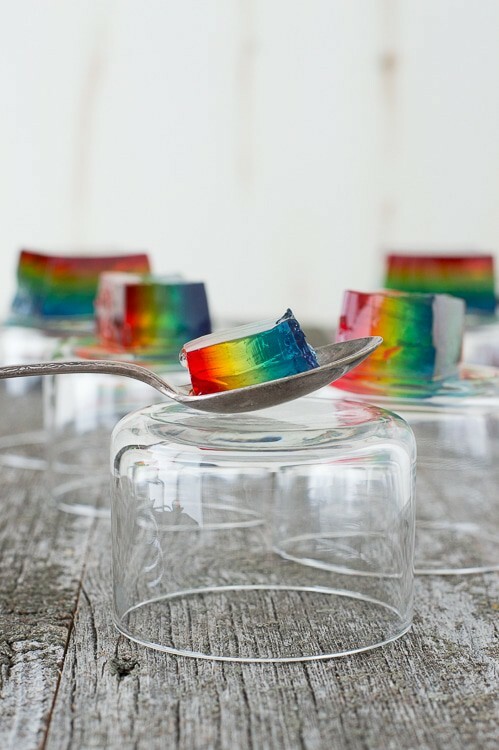 This rainbow jello is super easy to make, and it’s really delicious. It’s great that jello comes in so many different flavors. For the yellow layer, instead of having to get lemon jello, which I’m not sure lemon jello would be very good, they offer island pineapple, which is what I used and it’s tasty! I also saw apricot, melon fusion, peach, and tropical fusion. 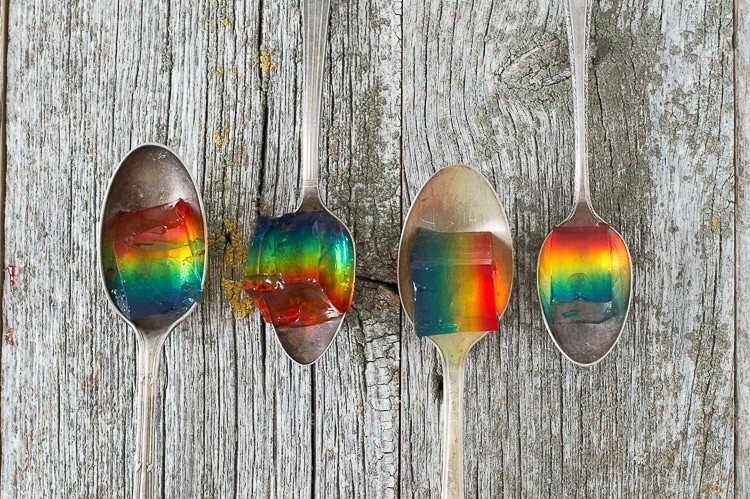 Just pick the colors and flavors you want, and you’re ready to make rainbow jello! 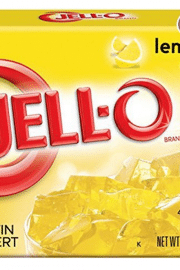 Prepare each layer of jello according to the package directions. They directions should be similar to: empty one jello packet in a bowl, heat water to boiling, measure out 1 cup of boiling water and add it to the jello powder. Stir until the powder is dissolved. Add in 1 cup of cold water, and stir again. Pour the jello into a 9×13 inch pan. Be sure that each jello layer sets before adding the next. Add the layers in this color order: purple, blue, green, yellow, orange, red. 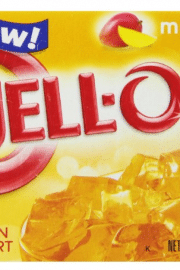 Once all of the jello is set, slice it into squares and serve. NOTE: DEPENDING ON HOW THICK YOU WANT EACH LAYER, YOU MAY HAVE LEFT OVER JELLO. I DID NOT USE ALL OF THE JELLO FOR EACH LAYER, I JUST TRIED TO MAKE THE LAYERS EVEN. My girls would have a blast eating these! I love the way this looks! 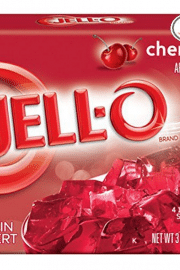 I am not big on jello but my kids are and they’d love this for sure! 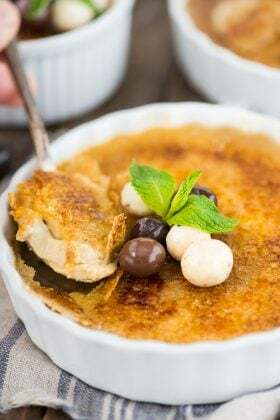 What a fun dessert and so pretty too! This would be great to serve up at a summer swim party. That’s a great idea Joanie! What a great idea with Easter coming up! 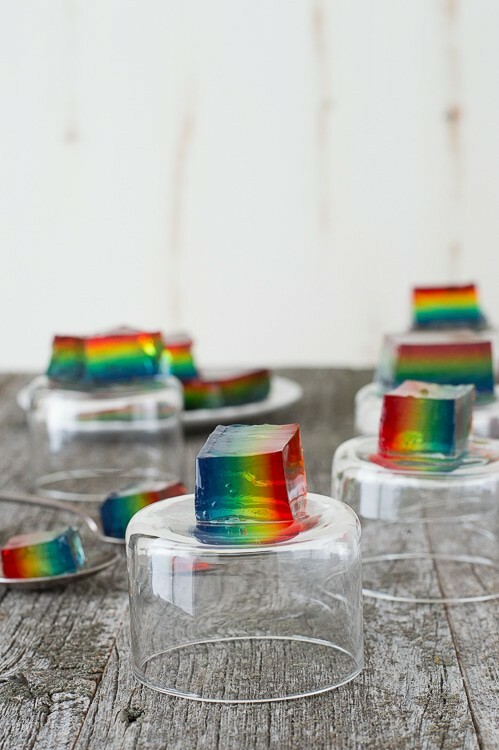 Wow, I’ve never seen rainbow jelly before, ever! This is SO cool! You and your layered jello! Mine would never turn out this cute…. We had a cold front come in too. After having temps in the high 70’s for almost a week, 23 degrees is a huge disappointment. 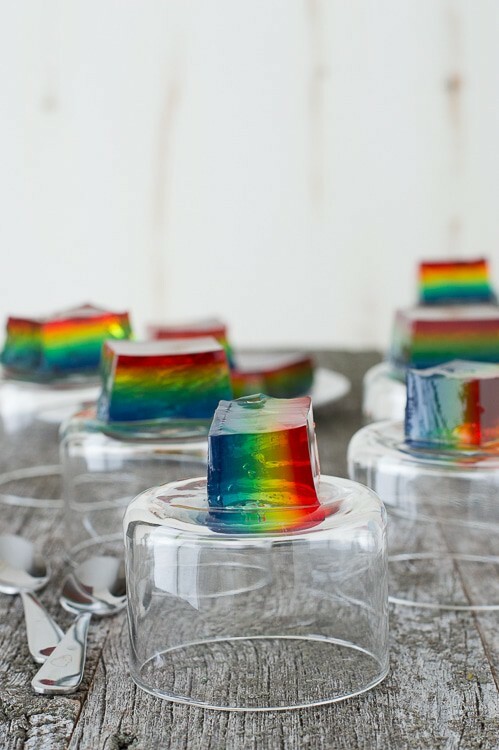 I should just create my own spring with this color rainbow jello! I woke up this morning remembering my dream about sitting outside in the sun while working! I can’t wait for warmer temps and sunshine, even if it means we have to deal with a few rainbows. This jello is sooo cute! What a cute idea Beth! 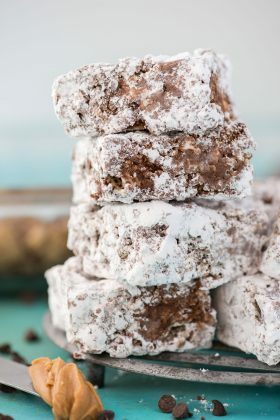 You always have such fun ideas and tasty treats! Have you ever seen them?!! These are utterly charming! I have a Rainbow Food pin board, so this is going on it! Perfect, thanks for pinning Dorothy! Did this take forever? Being you have to let each color set. My 5 year old granddaughter is OBSESSED with rainbows and this is on her activity agenda. Hi Jen! It doesn’t actually take much “hands on” time. A lot of the time is the jello setting because yes, you need to let each layer semi-set before adding the next. I think I made this recipes over a few days. Yes, after each layer sets you could! That’s a wonderful idea! I love this! I used to make them with a white layer separating colors. This looks (and I bet tastes) way better!